Following the 2017 season, Courvoisier McCauley will graduate from Manual HS in Indianapolis and enroll at Commonwealth Academy in Springfield, MA. 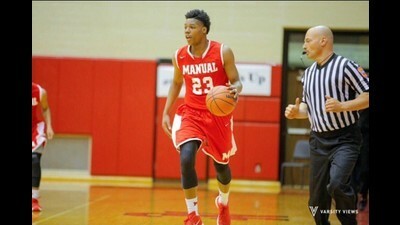 The 6'4" wing had a stellar junior season at Manual. He finished 6th in the state of Indiana in scoring with an impressive 27.2ppg (62 FG%), making him the second highest scoring junior statewide. The Redskins finished the season with 15-9 record. Despite his success, he felt that he was being underrecruited. McCauley received D2 offers from Central State, Chaminade, Kentucky State, and Saginaw Valley State during and after his junior season. To increase his exposure, he has made the decision to take a post grad year in 2018. "I felt like I was getting underrecruited and wanted to get out more and display my talents," said McCauley. Manual's head coach, Donnie Bowling, first met Tony Bergeron, head coach of Commonwealth, at Five Star Basketball Camp. This connection was the catalyst in McCauley's move to the New England prep school. "It was a decision [Bowling] and I made. We felt it was the best opportunity for me to pursue playing at the highest level." Coach Bergeron believes McCauley will thrive in his system at Commonwealth. "He is super multi-dimensional. Big physical wing, shoots, drives, rebounds. He'll be a monster in our system." Commonwealth opened in 2012. Last season, Spencer Foley (Canisius) became the first CA player to sign with a four year school. Current players include two D1 commits, Hasahn French (Saint Louis) and Shyheim Hicks (LIU Brooklyn), as well as a number of other prospects with multiple offers each. The class of 2017 will be the first graduating class for Commonwealth. McCauley looks forward to showcasing his abilities once he joins the squad in 2018. "My strength is able to the ball at all three levels. I shoot the ball well and I can flat out score," McCauley said. McCauley's decision had an immediate payoff, as less than 24 hours after he announced his intentions to attend Commonwealth, he received his first D1 offer from Iona of the MAAC. Bergeron coached Michael Glover and Lamont Jones, two former MAAC Player of the Year winners for Iona, at America Christian Academy in Pennsylvania. Fifteen D1 prospects, including Tyreke Evans, also played for Bergeron at the now defunct program. "Going to Commonwealth, I want to achieve greatness. [I'm working on] getting better offensively as well as defensively and increasing my vertical. As well as put on for my city, 317."